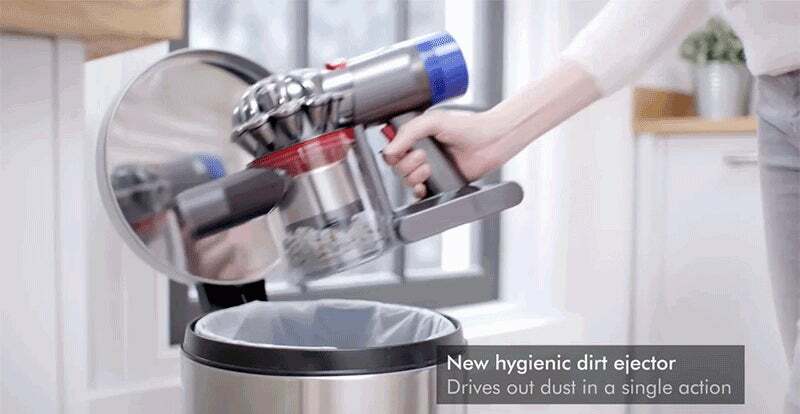 We called Dyson’s cordless DC59 Motorhead the first genuine replacement for a full-sized vacuum, even with a few annoying design quirks and limited battery life. 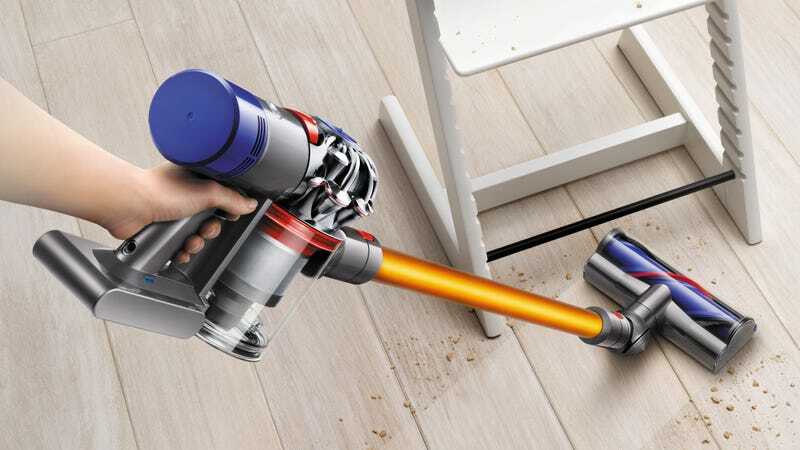 It has taken the company almost two years to design a follow-up, but the new Dyson V8 appears to fix most of the complaints we had with the original. 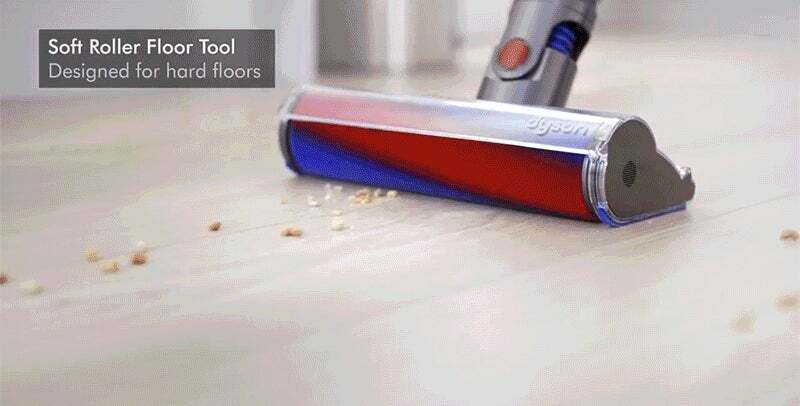 The rechargeable battery on the original Dyson DC59 had only about 20 minutes of run time. So you were either highly motivated to clean as much as you possibly could in that limited time frame, or move onto other tasks while you waited for it to charge back up. But thanks to an improved nickel-cobalt-aluminum battery, the new V8 can run for up to 40 minutes at a time, without its suction fading as the battery dies. Like with the DC59, the new V8 also has an optional ‘Max’ mode that boosts suction for dealing with resilient dirt like animal hair stuck to upholstery. On the flip side, it also reduces the vacuum’s overall run time, but the addition of a battery runtime indicator on the V8 provides an estimate of how much cleaning time you’ve got left. Another big frustration we had with the older DC59 was emptying its collection bin, which would often leave dust and debris stuck on the inside. Cleaning it was no picnic, so with the new V8 Dyson has incorporated a “hygienic dirt ejector.” It’s basically is a rubber collar that slides down the middle of the collection bin to scrape off dust and dirt stuck to its interior, without your fingers ever getting anywhere near it. Other improvements to the new V8 include a more powerful motor but redesigned airflow that it runs about half as loud as its predecessor, a dirt collection bin that’s 30 percent larger to reduce the number of times you need to empty it, and a dust-busting soft roller cleaner designed for hard floors. The kit also comes with the powered cleaner head that the DC59 included. In North America, the Dyson V8 cord-free will be available in Canada starting today on Dyson’s website and will hit stores in about a month. Availability in the United States is expected closer to the fall. With Canadian pricing set at $700, you can safely assume US pricing will be at least $500. But will it be worth the premium pricing? We’ll have a review of the new hardware in the coming weeks.